When it comes to CDMA wireless carriers in the United States we often forget about Alltel. They usually come out with whatever Verizon and Sprint come out with a month or so later. We can’t say that about the Red BlackBerry Pearl, however. Research in Motion knows that the battlefield for smartphone supremacy is switching from the corporate market to the consumer market and it would appear that the BlackBerry maker is truly about to debut it’s first BlackBerry accessory truly targeting the consumer Market. The Financial Post has discovered FCC filings of device registered to Taiwanese manufacturer, Uei Precision Industry Co., Ltd., however, the BlackBerry Remote Stereo Gateway has RIM’s logo and branding all over it. The BlackBerry Remote Stereo Gateway is pretty much what it’s name implies. A little device that you plug into your stereo that connects wirelessly to your BlackBerry via Bluetooth from which it can play music files through you stereo. Lets just hope that RIM is also working on the software side of things as well and will come out with a music store that you can buy songs over the air and a much improved media player. As some of you may know, I’ve been working on changing the theme here at RIMarkable. I am by no means a WordPress theme developer and thus it has been very slow going as I play with different templates when I get a little spare time here and there. I “think” that I have settled on the Neoclassical theme by Chris Pearson. If you want to check out what things may look like around here in the coming weeks, find out how after the jump. Remember when we talked about BlackBerry Professional Software back in November? Well, Research in Motion and Orange have launched BPS in Spain. BlackBerry Professional Server is a “lite” version of BlackBerry Enterprise Server geared towards small organizations with as few as one BlackBerry user and can grow up to 30 users. Vodafone UK and Research in Motion yesterday announced the availability of the GPS enabled BlackBerry 8110 with GPS in the UK. It seems like these things are popping up everywhere… except here of course. I received an email from Bplay yesterday which is posted after the jump. If, however, you want the short and dirty, fill out this Magmic Games / Bplay Survey and get 50% of your next Bplay purchase. In a move that can only be summed up as the boys in Redmond have decided that they would rather Mac owners buy iPhones than buy BlackBerrys, Microsoft has removed BlackBerry support from Entourage 2008 for the Mac. Not only has Microsoft removed native BlackBerry support, but they’ve removed it for third party applications like the Missing Synch. Say what you want about Microsoft, they generally make good business decisions for the most part. I have to admit, however, that I have no idea what they are thinking here. Opinion Research Corporation did a study that has revealed that smartphones, excluding the BlackBerry and the iPhone, were the most returned gadget during the holiday season. 21%, just over one fifth, of all smartphones purchased that weren’t named BlackBerry or iPhone went back to the store, primarily because people just couldn’t set the darn things up. Sometimes it’s pretty cool to be in the same category as the iPhone. Why Do You Love Your BlackBerry? It would appear that re-branding the BlackBerry OS from 4.3.1 to 4.5 is not the only thing the marketing department over at Research in Motion is working on right now. 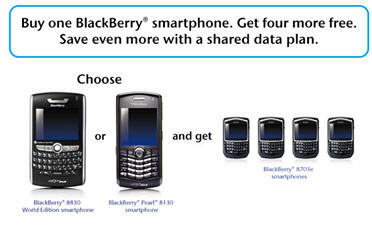 RIM has started a new ad campaign where they want you to Ask Someone Why They Love Their BlackBerry. BlackBerry owners can go to the site and share their stories as to why they love their BlackBerrys and there are several videos of featured BlackBerry owners telling there stories. It’s kind of a cool idea I guess. The main issue I see is that the featured owners all seem to be doctors, authors, TV producers, and successful entrepreneurs, etc. I guess that’s OK if the only demographic you are trying to capture are well to do business professionals. It seems to me, however, that most of these folks already have BlackBerrys.